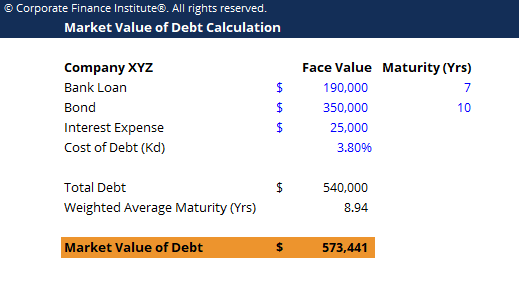 This market value of debt template shows you how to calculate the market value of debt given the FV of total debt, interest expense, cost of debt and weighted average maturity. The market value of debt refers to the market price investors would be willing to buy a company’s debt at, which differs from the book value on the balance sheet. To estimate the market value of debt, an analyst can think of the total debtCost of DebtThe cost of debt is the return that a company provides to its debtholders and creditors. Cost of debt is used in WACC calculations for valuation analysis. Learn the formula and methods to calculate cost of debt for a company based on yield to maturity, tax rates, credit ratings, interest rates, coupons, and on the books as a single coupon bond, with the coupon being equal to the interest expensesInterest ExpenseInterest expense arises out of a company that finances through debt or capital leases. Interest is found in the income statement, but can also be calculated through the debt schedule. The schedule should outline all the major pieces of debt a company has on its balance sheet, and calculate interest by multiplying the on all debt and the maturity as the weighted average maturity of the debt.